It is a good rule of thumb that if you emerge from a massive grand opera like Aida feeling any less than overwhelmed, you have a right to be somewhat disappointed. Such was the case when I left San Francisc Opera’s inconsistent production this past week. 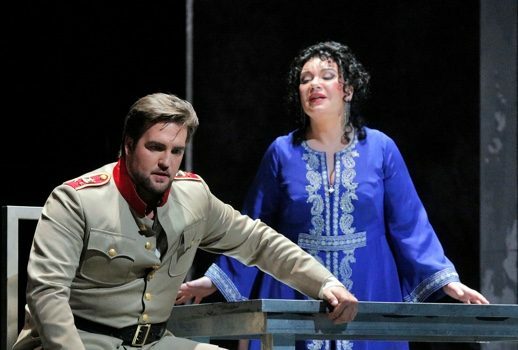 At times Francesca Zambello’s Aida fully realized the promise of Verdi’s monumental text, but at others that promise seemed to go unfulfilled. 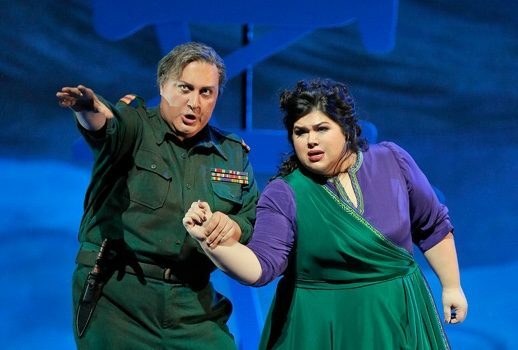 In the end a few vocal triumphs, notably Brian Jagde as Radames and George Gagnidze as Amonasro, were insufficient to spare the production from an underwhelming title performance and confused staging. The matinee began with an announcement that Aida herself, soprano Leah Crocetto, wanted to communicate her regrets that she was feeling “under the weather.” Considering that she chose to soldier through, perhaps my assessment of her Aida as anemic is a bit harsh; on the other hand, any singer’s decision to perform gives us license to judge her performance by the highest standards. From her first appearance onstage, Crocetto seemed to lack the gravitas of the tragic heroine. In her few but pivotal solo passages, her tone frequently erred more toward a lighter “classical” approach instead pf the weightier sound we typically associate with the role. Even in moments of high drama, her vibrato sounded more like a fragile quiver than the deeply-supported warm sound of a tortured lover. Her seeming detachment was exacerbated by less-than-expressive body language, which sometimes seemed better suited to a vocal recital than the operatic stage. Crocetto managed to reach a much higher level of musicianship and dramatic involvement at times when she sang in ensemble numbers. But she was when unable to fall back on her fine ability to blend, her performance was marred by a lack of emotional breadth, thinness of tone, and unpersuasive acting. More convincing were the performances of the three other leading roles turned in by Brian Jagde as Radames Ekaterina Semunchuk as Amneris, and especially by George Gagnidze as Amonasro. Jagde as Radames provided all of the tension between youthful love-drunkness and an insatiable drive for glory that define his role. His brassy and rich delivery matched perfectly with Verdi’s brass-heavy martial orchestration, frequently giving his tone a sense of simply materializing out of the orchestral ether. He was also convincing as an actor, with his awkward acceptance of Amneris’ hand during the full-ensemble triumphal scene particularly well done. Semenchuk as the Pharaoh’s daughter, Amneris, brilliantly walked the tightrope between arrogance and thinly-concealed insecurity, giving an air of inevitability to her eventual emotional collapse over Radames’ betrayal and sentencing. Particularly capable in the upper reaches of her mezzo range, she lent her character expressive depth through committed acting and richly varying coloration on held notes. 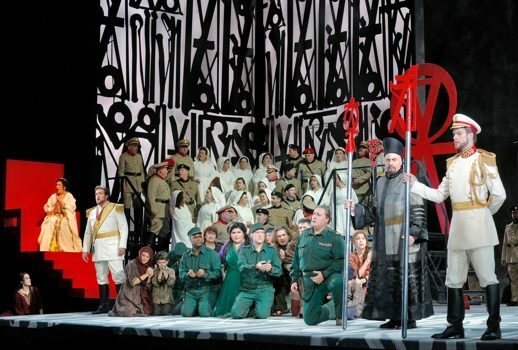 The production’s most outstanding vocal performance, however, came from Gagnidze as Aida’s father, King Amonasro. His initial appearance, as a disguised prisoner of war in the triumphal scene, was like a shot of adrenaline into what had to that point been a somewhat lackluster performance. With a full-bodied but beautifully shaped tone, each note staggering under the pain of defeat, Gagnidze raised the entire ensemble around him on stage to a new level of commitment. In my notes at that point, I wrote, “Such a relief to sense real investment!” And indeed it was. Nicola Luisotti’s orchestra was well-prepared and energized in its performance of Verdi’s highly gestural score—one built on small melodic cells, sequential repetition of musical material, and martial tropes. As is often the case in Verdi, most of the orchestral gestures in Aida have several layers requiring perfect balance—often a repeated bass tone, a (sometimes fast) moving middle voice which builds intensity, and a held chord on top. Luisotti managed to achieve perfect balance and coordination of these elements. He negotiated Aida’s signature challenge—the simultaneous alignment of chorus, instrumentalists in the orchestra pit, brass players offstage, and even a group of herald trumpeters onstage in the triumphal scene—with ease. It seemed almost a waste that amid a host of weaknesses in the opera, this most formidable challenge was executed perfectly. Chorus master Ian Robertson also achieved a technically excellent performance, coaxing transparent diction and clarity out of an enormous ensemble (123 onstage during the triumphal scene). Tender and vivacious in the all-female chorus at the start of Act 2, brassy in the triumphal scene, and ruthless at the final ritualistic trial of Radames, Robertson’s chorus found a wide variety of tone colors. An expertly directed orchestra and chorus might have been enough to make this a truly enjoyable performance had it not been for this production’s biggest swing-and-miss: its staging. Trying to figure out the intended aesthetic of this opera, I felt somewhat like Gordon Ramsey in one of his restaurant rescue shows, scanning a single menu that offers Italian, North African, and American options. When faced with such a menu, Ramsey will usually make a face and grumble: “Sounds like a fusion confusion.” Such an appraisal of this opera would not have been off base. In any grand opera, production designers and directors face one big challenge from the start: they must figure out a way to convincingly bridge the gap between the romantic Italian (or French) language and musical aesthetic of the composer’s world, and the often remote setting in which the action takes place. Operas like Aida must inhabit two different aesthetic worlds at once: that of their music, and that of their setting. Simply by virtue of this tension, a certain suspension of disbelief is required of every audience member at a grand opera. (Verismo needed something to rebel against, after all). Knowing this, it is incumbent upon the designer and director not to make staging choices that make the unbelievable even more unbelievable. In my opinion, SF Opera’s Aida failed this test. For one thing, while the idea of incorporating backdrop art designed by the urban graffiti artist RETNA may have been creative, set designer Michael Yeargan’s integration of it into the setting was confusing. This synthesis, which built many scenes around backdrops of bold, primary-colored graffiti-style designs incorporating Egyptian hieroglyphics, instilled a feeling of stark coldness that the music simply did not support. The landscape was often more evocative of Indiana Jones and the Temple of Doom than the cosmopolitan center of an ancient civilization. These staging decisions created two problems: First, it was hard to figure out where exactly we were: Ancient Egypt? Some more primitive society? Fascist Italy? (Another decent guess judging from the military uniforms). Second, whatever the intended setting, Yeargan’s focus on the militaristic undercurrents of Aida’s plot seemed to push him toward staging choices that undermined the opera’s deep warmth and humanity. The Spartan aesthetic was apparent not only in the opera’s several military scenes (including the opening scene), which took place on a stage set with only a few grey metal desks and tables, but even in the pull-out-all-the-stops triumphal scene, in which the Pharaoh was wheeled in on a metal dolly that looked like it could be used to retrieve lumber at Home Depot. While such bare, raw staging lent itself well to the opera’s most sinister moments—the ritualistic trial of Radames, for example—it made the opera almost unrelentingly dark. There were rare moments of respite: the women’s and young soldiers’ scene that opened Act 2, for example, was brightly costumed, warm, and voluptuous, giving a taste of the great variety this production could have achieved had a more traditional course been followed. Credit is also due for a creative use of ballet, which among other things added whimsy to the Act 2 opening. But such lighter elements were few and insufficient to counterbalance the general darkness. Overall, the setting caused a confusion in time and place. Though many productions manage to be successful despite that issue, the gloom and almost cartoonish primitiveness impeded my ability as an audience member to empathize with the characters onstage. How, for example, could the audience be expected to appreciate the agony of Radames’ choice between love and duty when his country was portrayed as so deeply drab? The combination of unsatisfying staging and a lackluster lead made this production uneven, despite superb performances in several supporting roles and excellent backing in the orchestra and chorus. Given a choice between an evening at Aida or SF Opera’s other current production, Jun Kaneko’s deeply touching Madama Butterfly, there is no question which you should choose.